11/16/09 Volkswagen is recalling certain model year 2006 through 2010 audi a3, tt, and tt roadster passenger vehicles manufactured between september 29, 2005 and august 26, 2009. the closing force of an internal spring of the fuel tank ventilation valve is not adequate enough to hold the valve closed under extreme driving conditions possibly allowing fuel to leak. Volkswagen's recall campaign number is 20q3/j3.owners may also contact the national highway traffic safety administration's vehicle safety hotline at 1-888-327-4236 (tty 1-800-424-9153), or go to http://www.safercar.gov . 10/20/09 Transmission and Drivetrain Volkswagen is recalling certain model year 2009 and 2010 passenger cars manufactured between september 2008 and august 2009. the wiring harness of a temperature sensor in the direct shift gearbox (dsg) may have connector wires that were insufficiently crimped. with insufficiently crimped connector wires, a temperature sensor has the potential to falsely detect a high gearbox oil temperature, causing the transmission to abruptly shift to neutral. if this happens, the selector lever position indicator within the instrument panel will flash. in addition, the "depress brake pedal" indicator light will be illuminated, alerting the driver to apply the brakes. Vw recall no.37e3/s7 & audi recall no. 37e5/j7.owners may also contact the national highway traffic safety administration's vehicle safety hotline at 1-888-327-4236 (tty 1-800-424-9153), or go to http://www.safercar.gov . 04/30/04 Transmission and Drivetrain On certain passenger vehicles with direct shift gearbox, during the production of the gearbox, a seam at the clutch was not welded to specifications. this could lead to degraded performance of the clutch inside the gearbox. Vwoa recal no. ja.customers can also contact the national highway traffic safety administration's auto safety hotline at 1-888-dash-2-dot (1-888-327-4236). 11/01/16 Electrical and Air Conditioning Volkswagen group of america, inc. (volkswagen) is recalling certain model year 2016 tt roadster, a3 cabriolet, a3 sedan and a3 e-tron, 2016-2017 tt coupe, 2017 a4 sedan and q7 and 2015-2017 q3 vehicles. the affected vehicles may have been programmed with new software that inadvertently makes the side marker lights inoperative in conjunction with the parking lights or the headlights. as such, these vehicles fail to comply with the requirements of federal motor vehicle safety standard (fmvss) number 108, "lamps, reflective devices, and associated equipment." 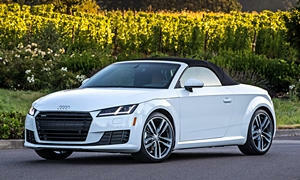 03/07/08 Other Volkswagen is recalling 720 my 2008 audi tt coupe vehicles. these vehicles were produced with c-pillar trim cover clips that do not provide adequate retention. in the event of a deployment of the rear pyrotechnic safety belt, the c-pillar trim cover may become detached from the sheet metal due to low retention force of the trim clip. Vw/audi recall no. 70d1/jx.customers may also contact the national highway traffic safety administration's vehicle safety hotline at 1-888-327-4236, (tty 1-800-424-9153), or go to http://www.safercar.gov.